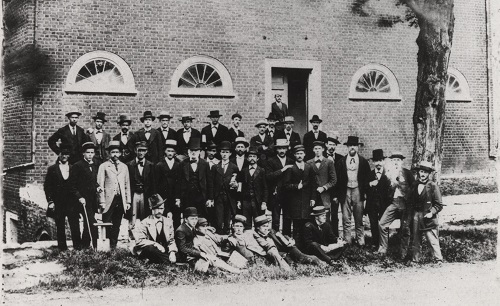 While many of our UVA Unionists attended the University before the war, very few enrolled after their service. In 1869, two young men from Parke County, Indiana, travelled hundreds of miles south to enroll in the University of Virginia School of Medicine. As veterans of the 149th Regiment, Indiana Volunteer Infantry, Marion Goss and Joseph Noble starkly contrasted with the typical UVA student profile. At the time, the vast majority of the faculty and student population maintained ardent pro-Confederate views, and many had served in the Confederate army. According to a eulogy given at Goss’s funeral, Noble and Goss were the only northern students at the University during their tenure. The University of Virginia Medical School first began offering courses in 1825. When Thomas Jefferson designed UVA, he envisioned a School of Anatomy and Medicine as an integral part of the University. Pavilion X housed the medical school, and a separate Anatomical Theater complemented lectures. Up until the Civil War, students could receive their medical degree after completing a nine-month curriculum and passing oral exams. Despite the lower expectations compared to modern medicine, UVA offered a more rigorous and far longer course of study than most medical schools at the time. Classes remained largely theoretical, however, because Charlottesville did not yet have a teaching hospital. When the Civil War began, Dr. James Lawrence Cabell and other medical school faculty treated approximately 22,700 Confederate soldiers in Charlottesville. Dr. Cabell remained on the faculty until 1889. Goss and Noble would certainly have attended his lectures. Despite the anti-northern hostility, at UVA Goss and Noble dedicated themselves to their studies, determined to establish reputable medical careers. They graduated in 1870, with Noble at the head of the class. Later, Goss influenced another veteran from his company, Jacob D. Mater, to attend the UVA Medical School (1872-73). But what would have motivated Union veterans to sojourn into the heart of the former Confederacy? The answer lies with the story of another UVA alumnus, Dr. John Wilcox, a man exiled in 1862 from his native state of Missouri to Indiana for his pro-Confederate views. In early 1865, hundreds of young men flocked to Terre Haute, Indiana, to volunteer in the Union army. Noble, Goss, and Mater enthusiastically answered the call. Having just passed their eighteenth birthdays, the three young men could at last legally volunteer without their parents’ consent. Mater and Goss had spent their entire lives in the same neighborhood. The two young men likely resolved to join the army together, with Mater enlisting for one year on January 25, 1865, and Goss following suit five days later. Noble enlisted at Terre Haute on March 10, 1865. Goss, Mater, and Noble mustered into Company I of the 149th Indiana. Captain Hiram Mater, Jacob’s brother, commanded the unit; almost immediately, the younger Mater received a promotion to corporal. Indiana had a strong history of Union army enlistments. Within a week of the attack on Fort Sumter, more than twelve thousand Indiana men volunteered for military service. The Hoosier state consistently produced some of the highest percentages of military volunteers. Parke County, located in western Indiana, sent approximately two thousand volunteers into military service during the war. While the majority of Parke County citizens voted Republican, Democrats maintained a sizable political minority and continued to garner about one-third of the votes in presidential elections after the war. Regardless of political party, however, the Union cause motivated the people of Parke County. When President Lincoln called for volunteers, Parke County’s “men ‘arose as one man,’ practically, to assert their devotion to the starry flag of freedom and Union.” Only fifteen when the war broke out, Noble, Goss, and Mater watched many of their older relatives and friends leave home to enlist. The young friends anxiously awaited their chance to volunteer. Although Noble enlisted in the 149th Indiana more than a month after his fellow Parke County volunteers, he had already faced combat. Lying about his age, the sixteen-year-old Noble enlisted in Company C of the 55th Indiana on July 14, 1862. At the battle of Richmond, Kentucky, on August 30, 1862, Confederate forces captured Noble and his unit. Noble was paroled and sent to Indianapolis where he awaited the expiration of his three-month enlistment. Between his service in the 55th and enlistment in the 149th, Noble seemingly returned to his father’s home in Bellmore, Indiana. He no doubt celebrated the safe return of his young son. His next tour of duty was less dangerous but no less eventful. In contrast to the action-packed service of the 55th Indiana, the 149th Indiana participated exclusively in garrison and guard duty, never losing a single man in combat. After mustering into service, the 149th left for Nashville, Tennessee, before moving to Decatur, Alabama. The regiment received the surrender of several Confederate generals, including Gideon Johnson Pillow and Philip Dale Roddey. Goss, Noble, and Mater mustered out of service with their unit on September 27, 1865. Their service in the 149th Indiana bonded the Parke County men, and they maintained frequent communication after the war. Goss, Noble, and Mater, born within months of each other in the same small Indiana county, experienced very similar childhoods. All three men labored on their fathers’ farms in Bellmore while attending Parke County public schools before their enlistments. Mater’s father, Ira Mater, gained local fame as a vibrant circuit-rider preacher in the Wabash Valley, invigorating the Christian community in the region. The trio’s families interacted regularly, and between their childhoods and wartime service, Goss, Noble, and Mater had grown quite close. All three men tried their hand as schoolteachers after the war, although they each ultimately found the profession unsatisfying. Like many young men looking to advance their place in society, Goss and Noble joined the Freemasons. The sons of small-town farmers, Goss, Noble, and Mater felt called to the vocation of medicine. Whether or not they recognized this desire before the war, the men must have frequently discussed their dreams of medical careers and ardently supported each other in the journey. In September 1867, Goss enrolled in preparatory classes at nearby Asbury University, now DePauw University, in Greencastle, Indiana. Wracked with health problems, Goss studied at the university for a mere two months before his doctor ordered him home. Goss had spent much of his Civil War service convalescing in Camp Carrington, Indiana, from myriad ailments, including sore eyes and rheumatism. Health complications would plague Goss his entire life, but he remained determined to pursue a career in medicine. In 1868, Goss returned to Greencastle, this time accompanied by Noble. Rather than enrolling in Asbury University, the two men studied medicine under Dr. John Wilcox, the very doctor who had first sent Goss home to Parke County. A native Missourian, Wilcox arrived in Greencastle, Indiana, through a dramatic saga of treason and exile. Born on September 12, 1829, Wilcox grew up in Boone County, Missouri, the son of Dr. George Wilcox. Following in his father’s footsteps, John Wilcox decided to pursue a career in medicine and enrolled in the University of Virginia School of Medicine in 1848. After graduating in 1850, Wilcox returned to Missouri to practice medicine. As the nation faced the secession crisis, Boone County remained heavily divided. Boone contained one of the highest concentrations of enslaved people in Missouri, and many slaveholders in the area expressed strong pro-Confederate sentiments. Many Unionists in the county anxiously feared attacks from bushwhackers. Distrust ran rampant in the region. John Wilcox owned two slaves in 1860, one thirty-five years old and the other ten. On April 19, 1861, Wilcox attended a “Southern Rights” meeting, in which he took a leading role. His fellow delegates elected him to chair a committee drafting the meeting’s resolutions. Although an ardent advocate of slavery, Wilcox swore an oath of allegiance to the Union on April 23, 1862. On September 8, 1862, Wilcox joined other Rocheport, Missouri, citizens in pledging to “exert [their] utmost influence to drive out all lawless bands of marauders, murderers, thieves, robbers, bushwhackers and Guerillas” who supported “the so-called Confederate Army.” For unknown reasons, Wilcox’s assurances failed to convince the Provost Marshal of the doctor’s loyalty to the United States. Brig. Gen. Lewis Merrill ordered the arrest of Wilcox and several other Missourians on November 7, 1862. Wilcox maintained that since taking the oath of allegiance to the United States, “I have not since then given aid or comfort to the enemies of our government.” Dozens of Rocheport citizens defended the physician, with one ally declaring, “no man in this Community Stands morally or Socially higher.” Yet Merrill remained unmoved and declared, “This man Wilcox has been always one of the worst rebels” in Rocheport. Merrill banished Wilcox and the other arrested men from Missouri, ordering them not only to leave the state but also settle somewhere north of Indianapolis and east of Illinois. Adhering to the order, Wilcox moved his family to Greencastle, Indiana, where he established a well-respected medical practice. By 1864, Wilcox wrote that he considered Greencastle as his new permanent residence. Throughout the late 1860s and early 1870s, many young Indiana men studied medicine under Wilcox, and he convinced at least half a dozen to attend his alma mater the UVA Medical School, including Goss and Noble. Despite his previous pro-Southern views, Wilcox became a treasured mentor to the Union veterans who apprenticed with him. After graduating in 1870, Goss and Noble returned to Parke County to practice medicine. While Goss and Noble studied in Virginia, Mater continued to teach school and work on his father’s farm. He actively participated in the Marion Kalley post of the Grand Army of the Republic (GAR). He eventually served as quartermaster of the post for a number of years. On August 25, 1870, Mater married Mary A. Galey in Parke County. The young husband decided to forgo teaching and farming for medicine and began studying under his friend Goss in 1871. After apprenticing with Goss for about two years, Mater followed the example of his mentors and friends and enrolled in the University of Virginia School of Medicine, graduating in 1873. Following the death of his first wife, Mater married Isabel Webster on November 19, 1876. No children from either of Mater’s marriages survived beyond infancy. Goss and Noble felt the call to family life shortly after Mater’s first marriage. On November 17, 1872, Goss married Mary Jane Mater, the first cousin of his friend Jacob D. Mater. Jacob’s father Ira Mater performed the marriage. Mary gave birth to their daughter Ida Belle Goss on March 4, 1875. On February 20, 1873, Noble married Laura B. Layton in Hendricks County, Indiana. Laura gave birth to one child who died in infancy. In 1876, Noble moved to Henry County, Missouri, where he both practiced medicine and ran a successful farm. After Noble’s wife Laura died, he married Jessie A. Moses December 14, 1888. Noble and his second wife remained childless throughout their marriage. In 1888, the people of Henry County elected Noble to the Missouri House of Representatives as a Democrat. After his congressional term, Noble transitioned from the medical field to banking. He later became president and partial owner of the Bank of Urich in Henry County. As his health declined, he retired and planned a vacation to California. Before he could depart, Noble died on October 31, 1907 after a series of paralytic strokes. His obituary observed that, “Death had no terrors for this good man and was characterized by the same Christian fortitude which marked his life.” He was buried in Holden, Missouri, according to Masonic ritual. Despite his move to Missouri, Noble maintained deep friendships with his comrades from the 149th Indiana, especially Goss. In the early 1870s, Goss grew to a position of prominence in the Parke County community. In addition to his membership in the Freemasons, Goss served on the Board of Trustees for the town of Rockville, actively participated in his GAR chapter, and joined the Independent Order of Odd Fellows, a fraternal organization whose members included Ulysses S. Grant, Williams Jennings Bryan, and Schuyler Colfax. Goss also founded the Parke County Medical Society and served as its president for a number of years. A fellow UVA Medical School alumnus named William H. Gillum served as secretary of the medical society. Shockingly, Gillum had served in the Confederate army, yet he became one of Goss’ closest friends and a beloved Parke County leader. Gillum’s arrival in Parke County will be covered in a subsequent blog post. Amelia F. Wald is a fourth year undergraduate studying History in the Distinguished Majors Program. She spent the summer of 2018 as the Nau Center Digital History Intern and is now a Sewell Fellow for the Center. Images: (1) UVA Medical School Class of 1873 (provided by the University of Virginia Library); (2) Group of Indiana Volunteers (courtesy Library of Congress); (3) Excerpt from order banishing John Wilcox (courtesy National Archives); (4) Joseph Noble's home in Henry County, Missouri (courtesy Library of Congress). Citations: Compiled Service Records for Marion Goss, Jacob D. Mater, and Joseph Noble, RG 94, National Archives and Records Administration, Washington, D.C.; Pension records for Marion Goss and Jacob D. Mater, RG 15, National Archives and Records Administration; United States Census, 1850, 1860, 1870, 1880, 1900, and 1910, accessed through Ancestry.com; Phillip Alexander Bruce, History of the University of Virginia, Volume III (1921); Parke County Historical Society, Parke County, Indiana: History and Families, 1821-1989 (1989); UVA Health System: 200 Years of Learning, Research, & Care. Edited by Holly Robertson. Charlottesville: Albert and Shirley Small Special Collections Library, 2018. Exhibition; Hiram Williams Beckwith, History of Vigo and Parke Counties, Together with Historic Notes on the Wabash Valley (1880); Parke County INGenWeb, http://www.ingenweb.org/inparke/; Emma Lou Thornbrough, Indiana in the Civil War Era, 1850-1880: The History of Indiana, Volume III (1965); B.F. Bowen & Co, History of Parke and Vermillion Counties, Indiana: With Historical Sketches of Representative Citizens and Genealogical Records of Many of the Old Families (1913); Hatie Lou Winslow and Joseph R.H. Moore, Camp Morton, 1861-1865, Indianapolis Prison Camp, Indiana Historical Society Publications, Volume XIII, Number iii (1940); Frederick A. Dyer, A Compendium of the War of the Rebellion (1909); Lorenzo Sayles Fairbanks, Fairbanks Genealogy of the Fairbanks Family in America, 1633-1897 (1897); John H. Eicher and David J. Eicher, Civil War High Commands, (2001); National Historical Company, The History of Henry and St. Clair Counties, Missouri(1883); “John Wilcox,” UVA Student Catalogue, Jefferson's University: Early Life, http://juel.iath.virginia.edu/public_person?person=29039#m1; The Rockville Tribune Dec 23, 1908-1927, accessed through the Rockville Public Library; “Wilcox, John,” Provost Marshall Papers, RG 94, National Archives, accessed at Fold3.com; The Urich Herald, 1907; Weekly Missouri Statesman 1861-1876; Michael Fellman, Inside War: The Guerrilla Conflict in Missouri During the American Civil War (1990); “John Wilcox,” 1860 U.S. Federal Census—Slave Schedules, National Archives and Records Administration, Washington, DC, accessed on Ancestry.com; Jesse W. Weik, Weik’s History of Putnam County Indiana (1910); “Marion Goss and Mary J. Mater,” Indiana, Marriages, 1810-2001, accessed through Ancestry.com; “Joseph Noble and Laura B. Layton,” Indiana, Marriage Index, 1800-1941, accessed through Ancestry.com; “Joseph Noble and Jessie A. Moses,” Missouri, Marriage Records, 1805-2002, accessed through Ancestry.com; Missouri Secretary of State, “Missouri State Legislators 1820-2000,” accessed at https://www.sos.mo.gov/archives/history/historicallistings/molegn; The Windsor Review Nov 7, 1907, accessed through Newspapers.com.